Engeny delivered a program of flood study updates across the entire RCC local government area (LGA). This encompassed over 6 major creek systems and numerous minor drainage areas. The project involved delivering 10 individual flood studies over the course of 18 months. The study area encompassed an area of more than 500 km2. Engeny committed a team of 3-4 engineers over the course of the project (18 months) to deliver the flood studies. The flood study program involved implementing the latest industry standard hydrologic and hydraulic modelling practices to develop state-of-the-art modelling tools and outputs for all waterways within the RCC LGA. 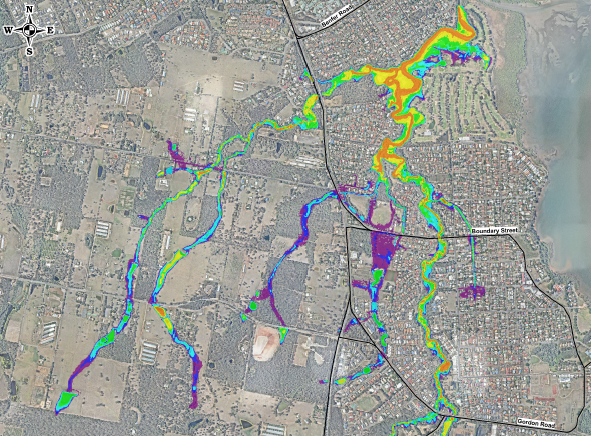 The RCC flood study program has been able to deliver state-of-the-art modelling tools for all catchments within the RCC LGA, and updated planning scheme inputs to develop future flood risk overlays. The flood study program was able to achieve consistency in flood modelling outputs across the LGA.